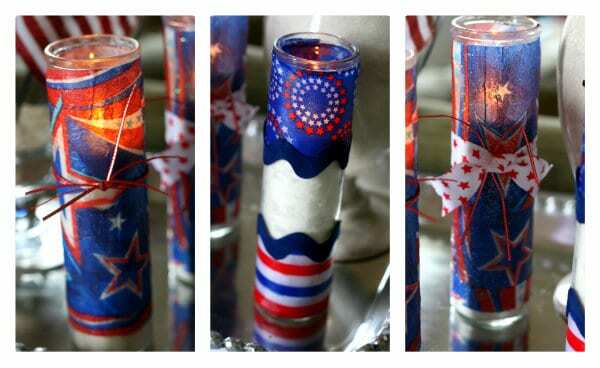 Make firecracker candles for Fourth of July using dollar store votives, napkins, and Mod Podge. These are so easy and inexpensive! 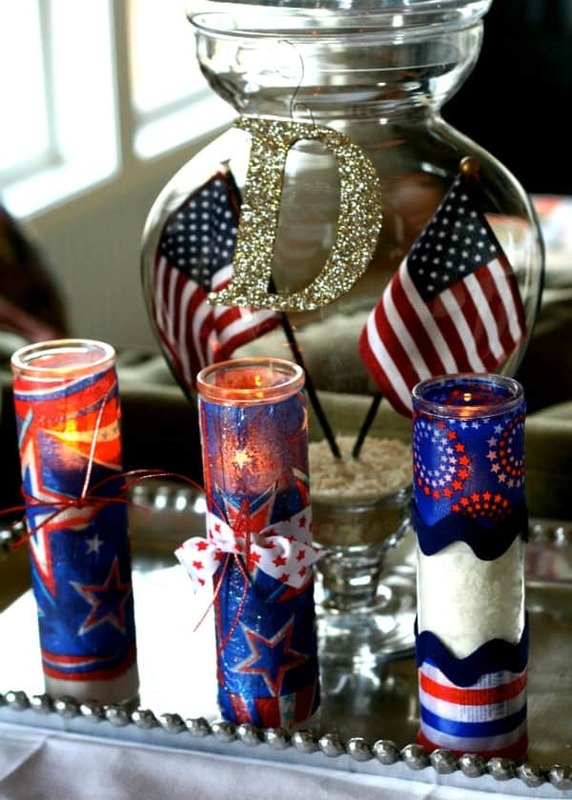 I know Memorial Day just passed, but my friend Kim from Today's Creative Blog made the most brilliant, patriotic candles with budget supplies and I had to share. 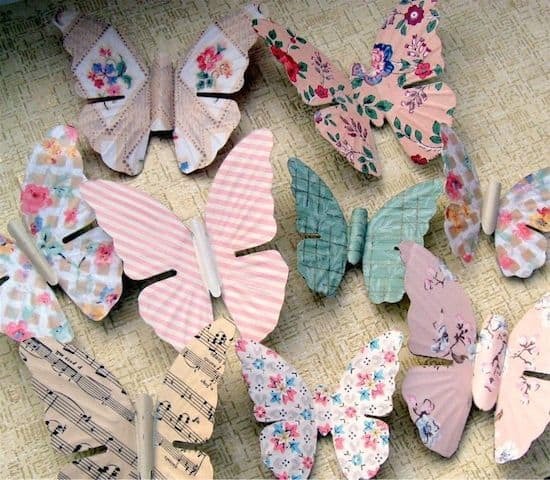 She was kind enough to guest blog, which delights me because her Mod Podge talent level is increasing, and very quickly. You have plenty of time to make these before the 4th (and this tutorial is very easy), so hop to it! 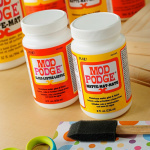 It's no secret that Mod Podge is my new obsession. I'm not sure if I'm addicted to the forgiving nature of the miracle goo, or because you can create simple and quick projects for your home. I love the trash can I made for my craft room using fabric scraps and love love love my tray I made with my vintage maps. Now I'm not usually one to decorate for Memorial Day or Fourth of July, but this year is different. 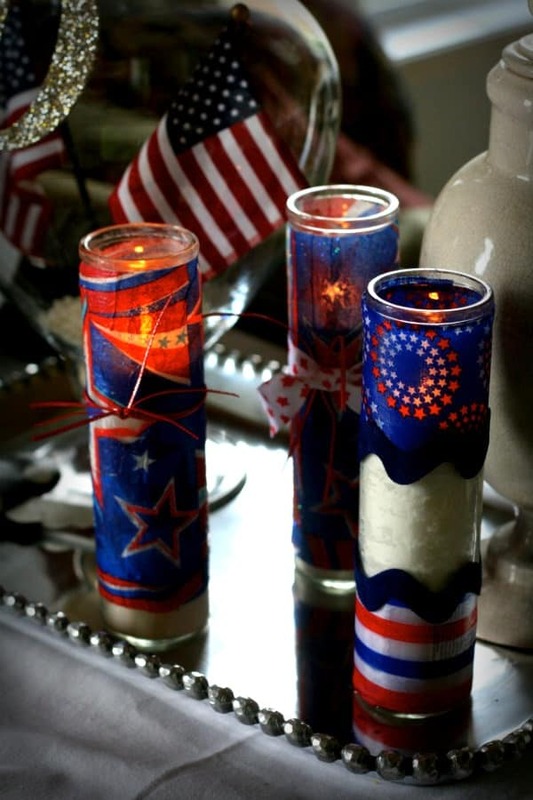 With Mod Podge by my side and a few patriotic items , I made myself some cute candles I plan to use on my patio . . . if it ever stops raining. I picked up the tall candles, ribbon and napkins from The Dollar Tree. Once home I used the regular formula of Mod Podge Gloss for two of them, and the Sparkle Mod Podge for one. I love how they turned out! I love how the glow from the candle bounces through the blue napkin. This project took me about 15 minutes, not including drying time. One thing to keep in mind however, take the labels off your candles . . . because the paper or ribbon will be somewhat transparent. No judging. Enjoy! 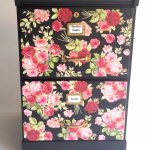 Thanks Kim – and please visit her at Today's Creative Blog for more awesome Mod Podging action. Is there a tutorial for these candles on her blog? I was not able to find it. I only saw some candles made with colored rice in jars. I haven’t placed these candles on my blog yet. But sometime around 4th of July.